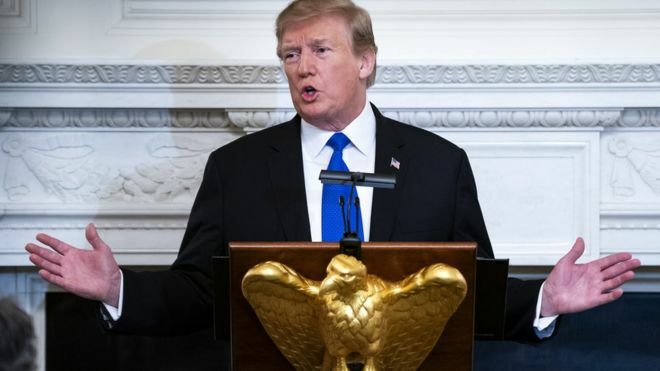 President Donald Trump has said that the US and China are “very very close” to signing a trade agreement, potentially ending the long-running feud between the two countries. Mr Trump told US governors on Monday that both nations “are going to have a signing summit”. “Hopefully, we can get that completed. But we’re getting very, very close,” he said. 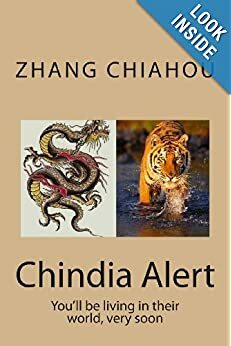 It follows a decision to delay imposing further trade tariffs on Chinese goods. At the weekend, Mr Trump said both sides had made “substantial progress” in trade talks following a summit in Washington last week. The rise in import duties on Chinese goods from 10% to 25% was due to come into effect on 1 March. Instead, Mr Trump said the US is now planning a summit with Chinese Premier Xi Jinping at the US President’s Mar-a-Lago resort in Florida. US shares rose on the decision to delay tariffs, with the Dow Jones Industrial Average closing 0.23% higher at 26,091.9. The S&P 500 and the Nasdaq also finished trading in positive territory. As he prepared to meet North Korean leader Kim Jong-un in Vietnam, Mr Trump also tweeted that a China trade deal was in “advanced stages”. Mr Trump’s decision to delay tariff increases on $200bn (£153bn) worth of Chinese goods was seen as a sign that the two sides were moving ahead in settling their damaging trade war. Last week, Mr Trump noted progress in the latest round of negotiations in Washington, including an agreement on currency manipulation, though no details were disclosed. Sources told CNBC on Friday that China had committed to buying up to $1.2 trillion in US goods, but there had been no progress on the intellectual property issues. Gregory Daco, chief US economist at Oxford Economics, said: “We had anticipated such a delay and believe a handshake agreement in which China will promise to import more agricultural products, work towards a stable currency and reinforce intellectual property rights protection will be achieved in the coming weeks. What has happened in the trade war so far? Mr Trump initiated the trade war over complaints of unfair Chinese trading practices. That included accusing China of stealing intellectual property from American firms, forcing them to transfer technology to China. 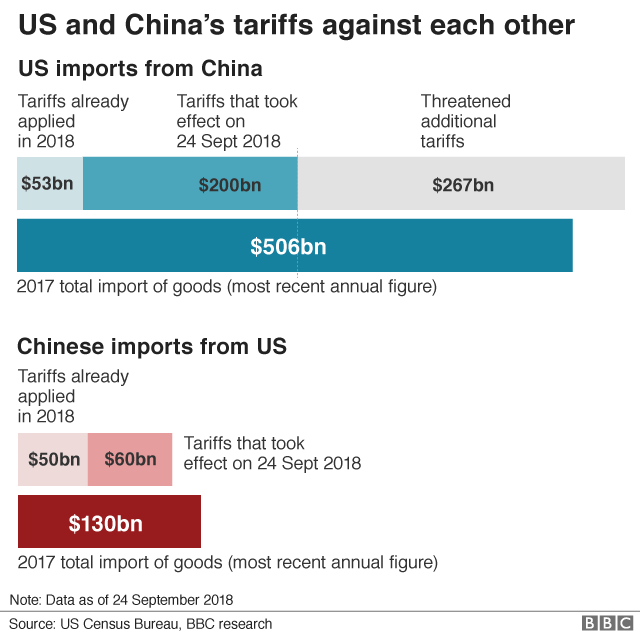 The US has imposed tariffs on $250bn worth of Chinese goods, and China has retaliated by imposing duties on $110bn of US products. Mr Trump has also threatened further tariffs on an additional $267bn worth of Chinese products – which would see virtually all of Chinese imports into the US become subject to duties. The trade dispute has unnerved financial markets, risks raising costs for American companies and is adding pressure to a Chinese economy that is already showing signs of strain. It has also stoked fears about the impact on the global economy. 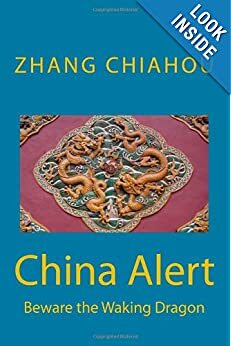 Last year, the International Monetary Fund warned the trade war between the US and China risked making the world a “poorer and more dangerous place”. Mr Trump said both sides had made “substantial progress” in trade talks, which sent Chinese stocks up nearly 5%. He added that he was planning a summit with Chinese President Xi Jinping in Florida to cement the trade deal if more progress was made. A report from China’s official news agency Xinhua also noted “substantial progress” on specific issues such as technology transfer, intellectual property protection and agriculture. 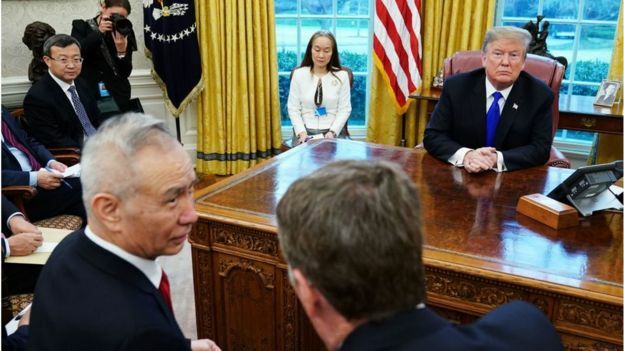 Mr Trump’s decision to delay tariff increases on $200bn (£153bn) worth of Chinese goods was seen as a sign that the two sides are making progress on settling their damaging trade war.